Buying Time, Not Stuff, Might Make You Happier : Shots - Health News A recent study suggests that when people spend their extra cash to get help with time-consuming chores, they're likelier to feel better than if they use the money to buy more things. Mowing the lawn can be good exercise, and is fun for some people. But others who find themselves squeezed for time might find the luxury of paying someone else to do it to be of much more value than buying more stuff. Money can't buy happiness, right? Well, some researchers beg to differ. They say it depends on how you spend it. 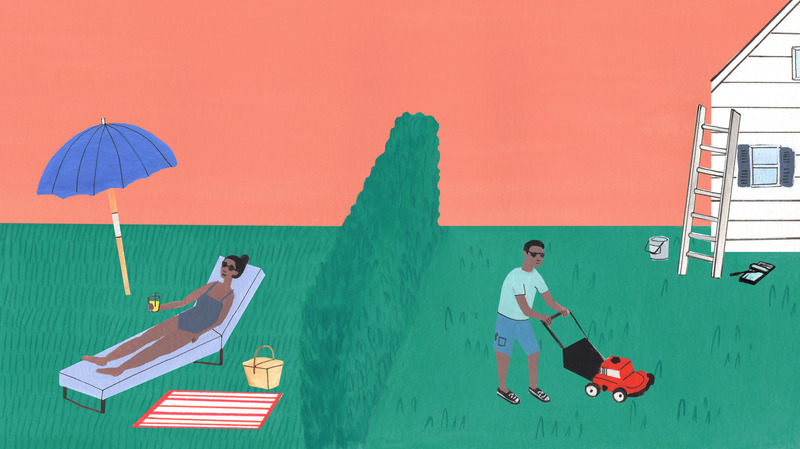 A recent study published in the Proceedings of the National Academy of Sciences suggests that when people spend money on time-saving services such as a house cleaner, lawn care or grocery delivery, it can make them feel a little happier. By comparison, money spent on material purchases — aka things — does not boost positive emotions the way we might expect. Think of it as a way to buy back what has become for many Americans a scarce resource: free time. Yet, in a culture where many people are quick to buy the latest model phone, a big-screen TV or a fancy pair of shoes, those same people are often resistant to spending money on time-saving services. "Contemplating paying somebody else to do something you're perfectly capable of doing yourself may provoke feelings of guilt," says Elizabeth Dunn, a professor of psychology at the University of British Columbia and an author of the study. Dunn and her colleagues had a hunch that if people spent money to hire out some of the unwanted tasks on their to-do list, they might feel more satisfied with their quality of life. "We hypothesized that people would be happier if they spent money to buy themselves out of the things they don't like doing," she says. As a test, she and her colleagues designed an experiment: First, they recruited 60 adults under the age of 70 from Vancouver, British Columbia. The researchers gave the volunteers a little cash and asked them to spend it in two different ways, on two consecutive weekends. "On one weekend we gave them $40 and asked them to spend it in any way that would give them more free time," Dunn explains. Participants in the study chose a variety of services — everything from meal delivery to a cleaning service to help with errands. Then, on the other weekend, the participants got another $40 to spend on a material purchase. They could choose anything they wanted within that budget. "One person bought polo shirts," Dunn says. "Another participant bought wine that she described as fancy." After each weekend purchase, the researchers called the participants and asked how they were feeling. The participants reported how much "positive emotion" they'd been experiencing and how much "negative emotion," Dunn explains. When the study participants spent money on time-saving services, they reported more positive emotion. "Buying yourself out of [tasks] like mowing the lawn or cleaning the bathroom — these were pretty small, mundane expenditures, and yet we see them making a difference in people's happiness," Dunn says. But how much happier? A separate part of the study helped to answer this question. Respondents completed survey questions about whether they spent money each month to increase their free time by paying someone else to complete unenjoyable tasks, and if so, how much they spent. In addition, the respondents were asked to rank their own level of happiness on a 10-point scale of life satisfaction. Think of the scale as a happiness ladder with 10 rungs. "What we found is that people who spent money to buy time reported being almost one full point higher on our 10-point ladder, compared to people who did not use money to buy time," Dunn explains. People from across the income spectrum benefited from "buying time," she adds. Moving up one rung on the happiness ladder may not sound like much, but the researchers say they're very excited by their results. "Moving people up on the ladder of life satisfaction is not an easy thing to do," Dunn says. "So, if altering slightly how people are spending their money could move them up a full rung, it's something we really want to understand and perhaps encourage people to do." Emanuel Maidenberg, a clinical professor of psychiatry and biobehavioral sciences at UCLA who was not involved in the study, tells NPR he was a little surprised by the results. He says it's an intriguing possibility to think about time-saving services as a "stress-management tool." But there are still some unanswered questions, he says. For instance, is the boost in positive emotions sustainable, "or is it just an immediate response?" Maidenberg wonders. The authors are "presenting enough data to justify a more careful look into this," Maidenberg says. "It's exciting."